The beginning of a project can be a very exciting period! Often projects come out of a reaction to a perceived problem where a solution is half determined before the problem is fully understood, ‘critiqued’ or even challenged. This can perpetuate as funding is sought, approvals from relevant personnel are obtained and a kind of consultation with stakeholders is completed. Before too long, there is a ‘brief’ for a building project which then is used to seek the engagement of architectural services. As Architects, we often get called in late in this process and get pulled in to the excitement of pushing a project forward as quickly as possible. This is fraught with issues which we identified in our earlier article – Engage Architects Early. Adopting a view that “building” will solve the problem, and it’s just a case of asking “where is it going to fit?” is not the most prudent approach to facilities planning and is not master planning. As we identified in our earlier article, this can lead to later problems with cost, time and scope creep. This is where an effective Master-planning process can be critical to the success of a project. A master plan provides a holistic view of the current situation, so future change can be accommodated efficiently and effectively. It is more than just locating existing and possible new buildings. 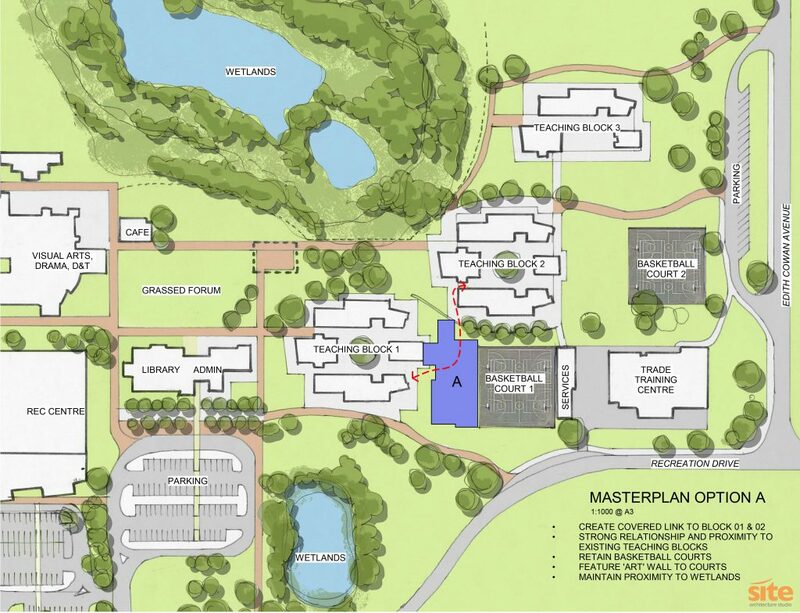 As a plan for change, master planning is not always focused on growth, either. At the start of a potential project, as a client, it is often better to take a step back and get advice from an experienced architect. Our attitude at SITE is to engage in a collaboration with our clients and ask many questions. We often see a project brief in place based on what is assumed is required, without much broader consideration. But, there might be a better solution. Rather than what?, we ask – why? The ‘why’ is important because as architects we are able to offer better, more considered options to solve design problems when we fully understand the context of an issue, how it came to be, what is driving it and what was explored or tried in the past. Our approach to master planning was to understand what it meant to ‘learn’ at Mercedes College. 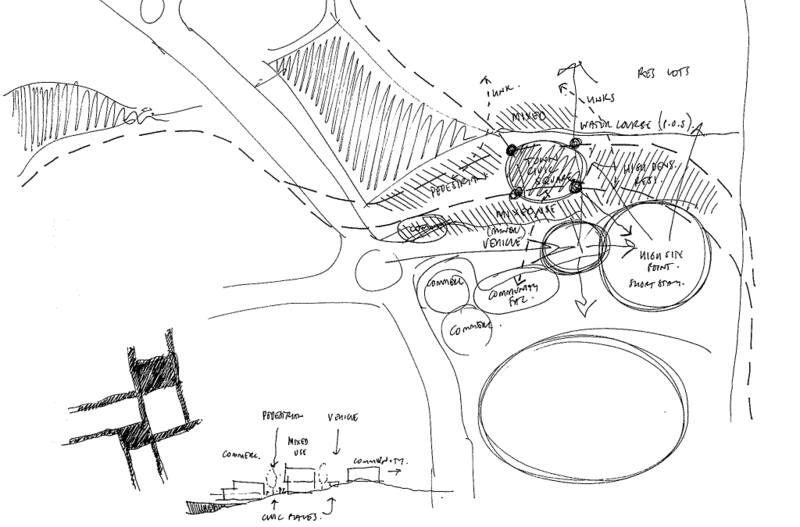 External, green and social of various scale emerged which informed the notion of central College Green effect connecting a peripheral ring of teaching and learning spaces. Master Planning should, but often doesn’t, adopt a “less is more” approach. SITE apply this approach to all of our projects including master planning, where we put our creative thinking to work. We look broadly at what the client is aiming to achieve and map a process which tests options in which the client’s objectives are achieved with the least amount of work. A process which has significant cost benefits. For example – a client might believe they need to expand their work space to accommodate new office staff, equipment or processes. Detailed ‘why’ questioning may reveal some solutions without building such as reorganizing existing spaces, changing management or organisational structures, time tabling or even outsourcing. Taking time early in the process to really understand the client’s situation is the start of a great master plan. It’s very easy to get caught up in the “now” and look at the project at hand but to better understand the opportunities and constraints of a current project you need to understand how it fits into a bigger picture. What has preceded this project, what is possibly going to be required in the short, medium and long term future can often have a big effect on the current project. In particular, in regards to narrowing down the best location of any new building and thinking what adjacent facilities could be used/ shared or adapted in the future. A suitably researched and informed Master Plan provides this clear ‘big picture’ framework to shape growth and change. Eaton Community College Science Building: Through our questioning and master planning at the beginning of the project, SITE avoided locating the new Science building on the existing hard courts as originally briefed and were able to provide additional security and direct covered access to the teaching facilities with the new building. Overall, when you consider the above, it is clear to see how important Master-planning is and how it can affect the scope of a potential building project. At SITE, we understand the importance of an effective Master-planning process informed by: a deep understanding of client needs, an approach of aiming to do more with less and considering the past and future design requirements. If done correctly, it makes for a much more successful project as it lays the foundation for a much clearer direction for future projects.